The season is almost at a close, but the battle for supremacy rages on. This was easily the toughest vote for me so far this season, as both top series delivered absolutely stellar episodes. It seems as if that was the case for the rest of the team, too, as this was one of the closest votes so far. As usual no other series came especially close, but we did see our first-ever votes for a couple of series (like Fukigen na Mononokean, which I almost ranked myself). As for the “Ask the Writers” question this week, this was about as close to consensus as we’ve gotten on a topic. Again the question proved much more difficult to answer than I initially thought, but a lot of our writers clearly have similar views – which is surprising, given how different our tastes in actual series tend to be. If you could only watch one genre of anime (be as specific or general as you want, within reason) for the rest of your life, what would it be and why? Stars: Another tough question. For the most part, I’ve really stuck to the fantasy genre for just about every piece of media I consume. It’s that element of escapism that really appeals to me. Real life is already filled with so many relationship issues and mundane struggles that watching a series filled with a cast undergoing similar struggles seems redundant, somehow. It’s not just that, though. I’ve always enjoyed fantasy world-building. Learning about fictional landscapes, religions, cultures, and politics feels is a pleasant exercise for my brain. How would X effect Y? What if Napoleon rode dragons into battle? What if magic was available to everyone? Fantasy in animation is a medium where anything and everything can happen. It’s an indirect reflection on our lives and trials that makes them more palatable. There’s always going to themes of doubt, self-worth, growing up, and finding that special someone, but when we view them through a fantastical lens, it’s like watching a fire from a distance. Not close enough to burn, but still close enough to feel the heat. Enzo: This is another one of those questions that’s tougher than it seems. The really challenging part is how flexible the genre definitions can be, and how a single series can merit many of them. I often find I have shows that combine my favorite genres – sports anime with romance, sci-fi with coming-of-age, et al. But as I look at my lifelong anime list, the only honest answer I can give based on what I’ve tended to grade highest is fantasy – it touches more of my favorite anime than any other genre. If you like, call it “Japanese fantasy” – stuff that’s embodied in Shinto and other Japanese notions, like Mushishi, Natsume Yuujinchou and Anohana. Be it historical fantasy (Seirei no Moribito), romantic fantasy (Akatsuki no Yona), or “pure” fantasy like Mushishi, fantasy is a part of the blend with my favorite series more than any other genre. Stilts-nii: Fantasy. Obviously. Fantasy adventure, if you want to be specific. I write fantasy adventure novels. Obvious answer. 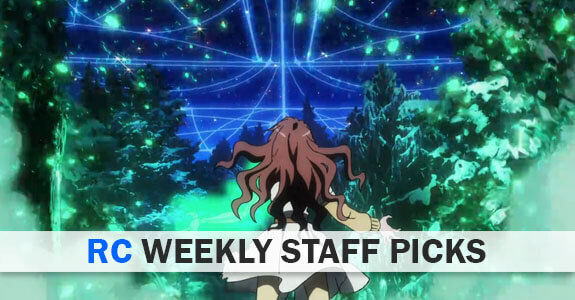 Passerby: Answering ‘fantasy’ feels like cheating as fantasy is far and away the broadest anime genre and all manner of shows can be argued to fall under it. I’m an anime generalist who likes to sample across the spectrum, so if I’m forced to choose I’ll prioristise hanging onto as much as possible. I’m also the kind of guy who wishes for more wishes, of course I’m going to cheat. Choya: I’m going with Comedy because so many of the shows I like to watch at my own leisure all fall under the genre. Whether it’s to relax or just have a great laugh, its nice to have a wide range of anime available that are able to easily hit the spot. Even better are comedy series where you see gradual character development over time since it gives me the illusion of enjoying high-brow entertainment, but also strikes me at my core when an otherwise humorous character gets a level of respect and emotional range that give them more significance and meaning than the gags that happen with them or the quirks that define them. 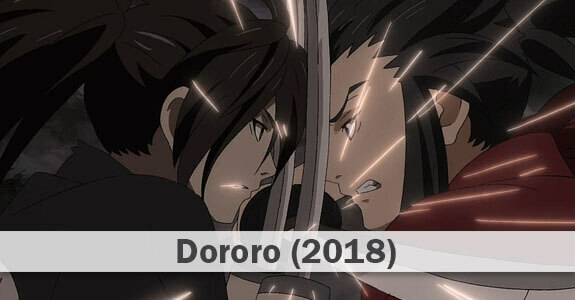 Because of the vast array of anime that qualify as comedies, I also would have a large pool to select from, whether they are focused on romance, action, or healing. Pancakes: Sci-fi without a doubt, because nothing else comes close to satisfying both my history and technology itches (cyberpunk is amazing didn’t you know?). Also when everything from quasi-magic space opera to near future isekai and even comedy (*looks at Space Patrol Luluco*) falls under its wings I won’t be missing out on too much material to binge when the anime watching urge hits. Zaiden: If it counts, coming-of-age is the genre I’d pick. It covers so much ground, and as someone who typically watches shows for the characters and their development, most of my favourite kind of shows would remain available to me. space opera in the vain hopes someone in the anime industry goes insane before i die and they actually produce Dune anime. i goddamn wanna see God-Emperor and Hwi Noree animated. and yes, i know the je…hollywood is doing a dune film, but i have zero hopes of it being good due to, ya know, CURRENT YEAR POLITICS. I’m hoping for an Infinite Ryvius remake project(Maybe movies) or Banner/Crest of the Stars from Sunrise. We don’t get much Space shows because they’re generally more expensive to produce than your typical generic high school based anime. We also got battle angel alita though, which ignored those same politics. sorry dude, too old and had way too many letdowns to have even a speck of hope for the future. never watched alita tbh, but did watch (((merchantguild-productions))) version of my beloved ghost in the shell to form my opinion on any future anime/manga related kino from america. You guyses should definitely watch Kanata no Astra when it comes out. Very old-school space opera anime sci-fi, though definitely not of the emo variety like Ryvius or BotS. the premise sounds somewhat like the best stargate, that be universe. the freaking best one and, of course, sy-fy being sy-fy, they axed it just as it was getting good. same with helix, oh lordie, how do i miss thee, helix. I read the manga, and I’m really looking forward to the adaptation. They spent 2 episodes fighting that dude and Reigen comes in and defeats him in 5 seconds lol. Great writing. So Enzo, Hi Score Girl Season 2. Japan didn’t disappoint! Awesome news, yes, and the discs didn’t even sell that well. That’s becoming less important now, though, as home video income is way down across the board. Seeing the merchandising and cross-promotional stuff like HSG cafes and such gave me some hope the series was doing what it needed to do for the production committee, but it was still a massive relief. No mangaka ever deserved to have his series properly adapted than Oshikiri Rensuke (and fanbase, too). He was royally screwed over for reasons entirely outside his control. If I would be asked – Space opera. I grew up on Star Wars and Legend of Galactic Heroes was second coming of Thrawn for me if you know what I mean. I would fancy myself some historical fantasy or shonen action. I actually had a really interesting conversation with Passerby once about the definition of slice of life. It can be a rather broad terminology that permits the widest spread of access to shows, assuming the depiction of everyday life meets the genre description. Definitely a great choice. I quite agree with Stars on the answer, though a lot of “Classic” fantasy trope anime I feel are not great, but I’m talking about anime I have not watched and merely going be impressions (i.e. Legends of the Legendary Heroes?). Thankfully fantasy also includes wonderfully bizarre things like Jojo, Akagami Shirayuki, Akatsuki no Yona, SnK, Bleach (BACK in THE Days), and would even Boku Hero be Fantasy? I’m getting confused between sci-fi and fantasy maybe. The list goes on. 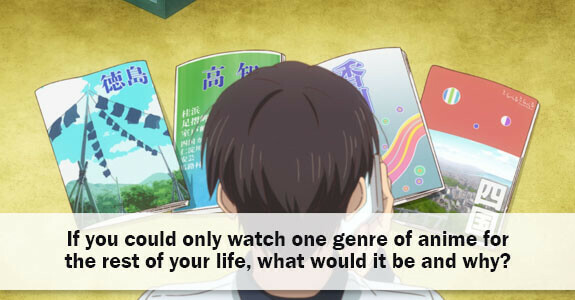 I would pick slice of life. Have always been interested in what goes on in the lives of others, esp. when their setting is different.